A lot of factors go into being featured as Customized Girl’s storefront of the month. Creative designs, a great logo, and a brand with purpose are just a few attributing qualities we consider. FairFox Roller Derby is a storefront that exhibits all of these qualities making them Customized Girl’s storefront of the month! “FairFox Roller Derby is a Rec League inclusive of any woman that wants to play the sport of roller derby. We play in a supportive and encouraging environment, while still pushing ourselves to become better players, as individuals and as a team.” FairFox has an open door policy giving all woman the chance to play roller derby regardless of experience. This is an amazing opportunity on FairFox’s behalf to give all women the chance to try and learn something new. 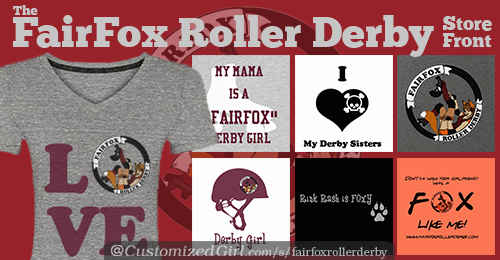 The best part of FairFox Roller Derby is now you can grab their amazing swag! Their storefront offers socks, pinnies, tees, and sweats – giving you endless options to choose from. Designs include team gear with their unique logo but they also incorporate simple roller derby love tees and tanks. FairFox has a fabulous logo and they have some of the best and catchiest roller derby sayings on the market. Mix the two and you have some of the best custom roller derby gear on the web. So what’s holding you back? Grab your FairFox swag and start skating! With October being Breast Cancer Awareness month many organizations and businesses rally together to help raise awareness and funds. 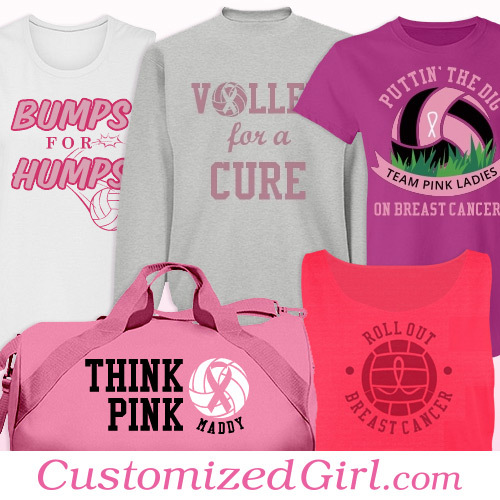 One of the most popular ways to show support and awareness is wearing custom designed pink apparel for your sports team. High schools, clubs, and professional leagues all participate in wearing pink apparel with their team name and number. 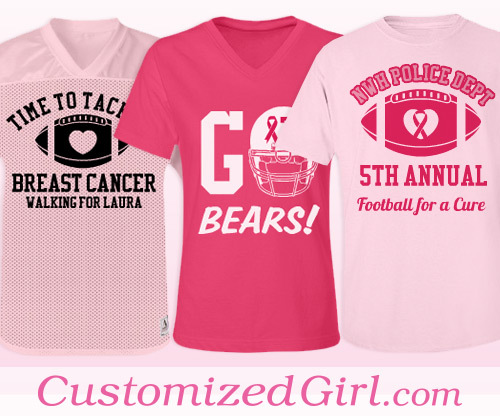 At Customized Girl we offer a plethora of pink apparel including football jerseys, socks, and bags that are readily available to customize to your teams needs. If you don’t see designs supporting your team or if you need help customizing gear let us know! Customized Girl would be more than happy to help design and customize tees, jerseys, bags, and more specially for your team! Don’t forget to use promo code PINK14 at checkout to get $4.19 off your order for free US economy shipping! Also, when you use promo code PINK14, 10% of the proceeds from your order will go to The Stefanie Spielman Fund for Breast Cancer Research! Halloween is the one time of year to really show off your creativity and put your do-it-yourself skills to the test. Halloween allows individuals to take an any idea from spooky to funny and make it come alive through their costume. The majority of the time people are not only trying to find the perfect costume for themselves but for their buddies to assist them in all the fun festivities. Constructing the perfect costume or even looking for the ideal costume can take a massive amount of time. Once you find a decent costume it might not have everything you want and can be incredibly pricey. Look no further because Customized Girl has the best to offer in creative custom halloween costumes. Matching Halloween costume shirts are perfect for you, your significant other, your best friend, or even your entire sorority. 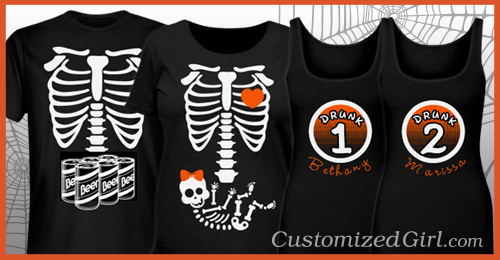 What makes our matching halloween shirts so unique and special is that you can customize each shirt to specifically fit each individual person in your group and you won’t break the bank! 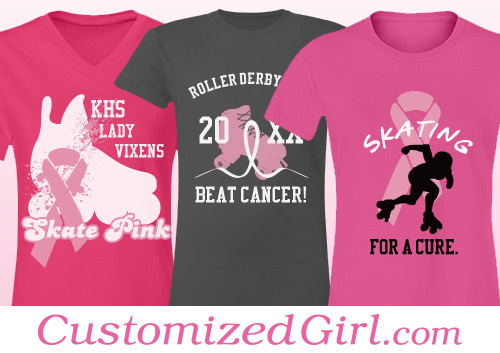 If you have a large group or designing shirts for six or more, you’ll receive Customized Girl’s group discount. We’ve already supplied some great designs to get you started but we would love to hear what you come up with! To honor breast cancer month, Customized Girl has put together a list of some of our favorite and trendiest breast cancer slogans. Breast cancer slogans can be used to show support to someone who has been affected by the disease or simply to raise awareness. We hope these sayings can inspire, motivate, or just make you laugh. 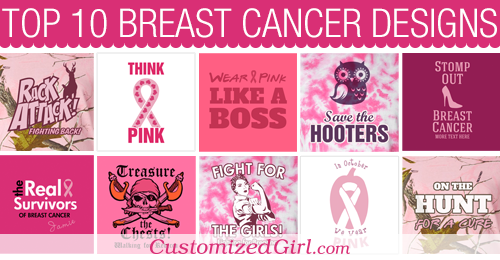 Here at Customized Girl not only do we get the opportunity to promote breast cancer awareness but we get to see amazing, creative designs printed every day. We would to hear and see how you are helping the fight against breast cancer. Sharing your stories and pictures will only help raise more awareness so why not let us know your story! Are your raising funds for an organization or individual? Let us help you design the perfect breast cancer shirt or open up a Customized Girl storefront to raise funds and spread awareness. Join Customized Girl as we kick off for Breast Cancer awareness month! While most people are aware of breast cancer, many forget to take the steps to detect the disease in its early stages and also to encourage others to do the same. 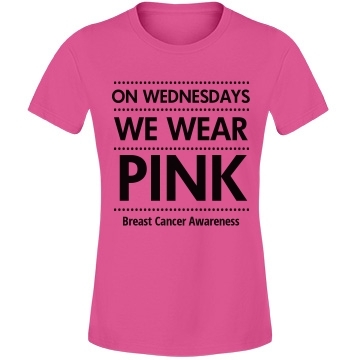 Here at Customized Girl we will be showing support and awareness by representing our “Pink Wednesday” designed shirts. Every Wednesday during the month of October, in honor of breast cancer awareness month and our fundraiser with The Stefanie Spielman Fund for Breast Cancer Research. 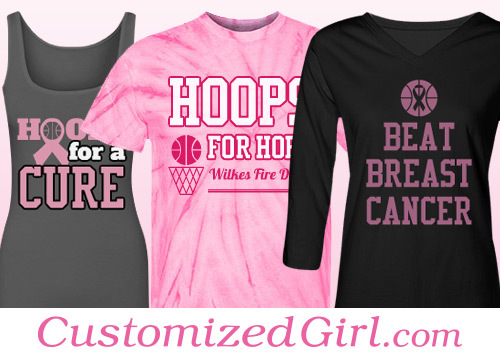 Our “Pink Wednesday” design is one of many breast cancer designs that we have to offer on Customized Girl. 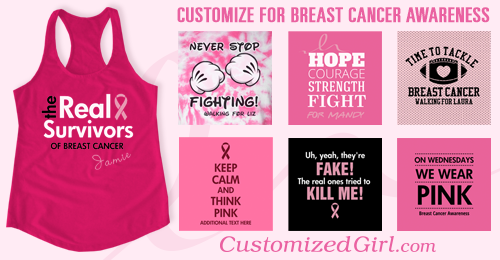 You can take any of our preexisting breast cancer designs and customize it to one of our many products ranging from t-shirts, hoodies, jerseys, and accessories. Need a pink shirt for pink Wednesdays? No worries! We have plenty of pink shirts that you can customize for pink Wednesday! Personalize your shirt and share it with us by using #PinkFighter!